Bicycle riders come in every size and configuration – fit or fluffy; fast or incredibly slow; one, two or three wheels; fancy spandex clothes or faded blue jeans. There are lots of variables, yet one unifying passion – the freedom of being self-propelled, the wind in their faces, healing themselves. The wide shoulders and relatively smooth pavement of State Route 347 have lured cyclists from Metro Phoenix to Maricopa, both for leisure riding and training. “I like riding around the community. It’s flat, easy riding that allows me to ride 20 miles without feeling worn out,” says cyclist Lee Mann. Mann was drawn to Maricopa for the year-round cycling opportunities the city would like to emphasize as it looks 25 years in the future. Safe bicycle routes in Maricopa are among the transportation goals of the city’s new 2040 Vision Strategic Plan. Cyclists have strong ideas about what already works in Maricopa and what the city needs to meet those goals. 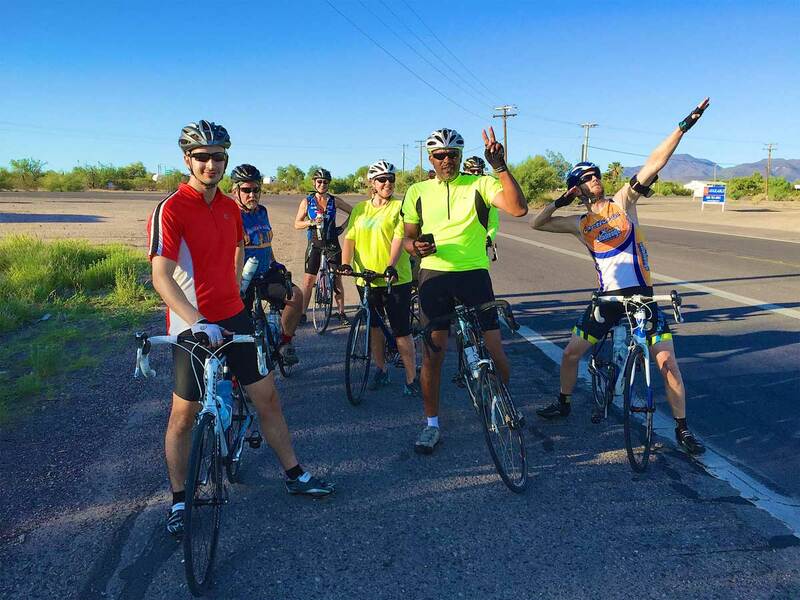 The Maricopans with whom cyclists share the road can make or break the experience. “Most drivers recognize the three-foot rule, especially on the farm roads south of the tracks,” says Janean Jump, a teacher at Saddleback Elementary School. Local residents and cycle enthusiasts Tom and Jenny Radigan have suggested Maricopa host a monthly or quarterly bike event, in which a main road is closed to motor traffic and the community is invited to ride bikes to and from a business or activity. These types of rides have succeeded in other areas of the country. Such gatherings promote idea-sharing among cyclists. Some of those ideas have been part of the 2040 Vision. With a grade-separation at SR 347 at the railroad tracks on the horizon, Jump says cyclists should not be forgotten in the design of the overpass. Maricopa needs bike lanes on all major streets, including SR 347 and Maricopa-Casa Grande Highway, Brian Gould says. Motorists are required to share the road with cyclists. Arizona Revised Statute 28-812 states, “A person riding a bicycle on a roadway or on shoulder adjoining a roadway is granted all of the rights of a vehicle.” The law (ARS 28-735) also requires drivers leave a safe distance between their motor vehicle and bicycles of “not less than three feet” when passing. Pete Masiel is an avid bike racer and competes nationally. He has a particular vision of how important cycling paths can be in the city’s connectivity plans. When it comes to a big vision a quarter-century down the road, Gould calls up the example of the I-5 Colonnade in Seattle, which has a bike-skills park to practice safe cycling. The Colonnade has diverse trails, jumps and berms, he says. Check out “Maricopa, AZ Cyclists” on Facebook. Create safe and functional pedestrian ways and bicycle routes throughout the City of Maricopa. · Develop bike lanes on all possible arterial roadways and reasonable connections reaching all shopping and population centers within the city. · Establish and maintain a citywide trails and pedestrian plan. · Develop pedestrian trails and bikeways connecting all parks, greenways and commercial areas within the city.